Dawna's writer's workshop this week was to choose something and describe it using sensory detail. She chose to describe her baby sister, which I thought was very sweet :) I post this as the prideful Mama of an excellent second grade writer. Also, the original is going in Jade's baby book; it's THAT good! In preparation for Halloween, we made these delicious hot dog mummies! 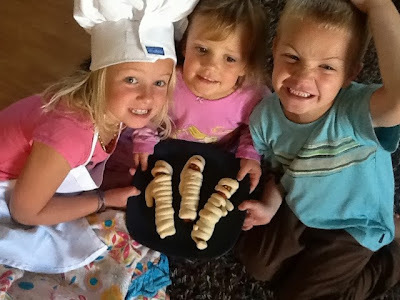 I used a pretzel recipe from the Children's Friend magazine, rolled the dough out flat, and cut it into thin strips with a pizza cutter. The eyes are two little dabs of mustard. Turning over a new leaf... weekly posts, as inspired by my amazing sister-in-law. Let's begin now. What could this be, Mr. Evans??? 5. General Conference, Jamba Juice for breakfast, 3 mile run around the wetlands in my new Xero shoes, and dinner at Nijo Castle... FINALLY!!! I have wanted to go to that restaurant since I was in high school and I finally got to go! I was joined by a lot of my family; we actually filled up an entire tepanyaki table! our chef, Amando, who Dad has had the last 3 times. He was awesome! My cutie and I ... eating and lovin' it! 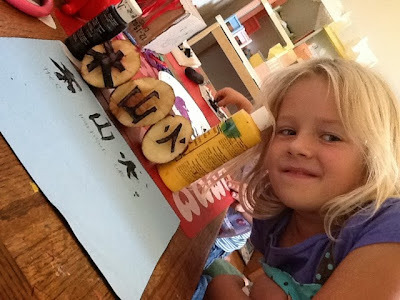 Our story of the world lesson on Chinese writing as it transitioned from pictograph to calligraphy. We chose a character and carved it out of half a potato. Bottom line: we are very grateful for our printer!